No. 1 Seed Outlawz wrapped up the regular season unblemished with an 8-0 record. They will be facing No. 4 seed No Size, who finished the regular season 4-4 but has won four of their last five contest including a convincing first round victory over Ankle Bullies. These two teams met once during the regular season in Week 8 which resulted in a 19-point victory for the Outlawz. Outlawz was lead by their athletic forward Zavian Nevels 24 points on 12-16 shooting from the field. Outlwaz also got a big game from Robert Reddick who added 18 points along with 7 rebounds. Also in that Week 8 matchup No Size was led by their two most consistent players Max Lewis and Matt Wilhelmi who combined for 46 points. They have combined to average 50.7 ppg, while No Size as a team is averaging 73.3 ppg, which is fifth among all teams this season. For No Size to pull off the upset they will need a full roster and a valiant effort from their role players and bench. Outlawz likes to get out and run after creating turnovers. They are averaging a league high 8.9 steals per game with three players recording double figure steals on the season in Jeffrey Levesque, Zavian Nevels and Robert Reddick. No. 3 Level Up vs No. 2 Gr8ful Eight is certain to be a hard-fought game with two highly competitive teams. These teams also met once during the regular season in Week 6 which ended in a five-point defeat for Gr8ful Eight giving them their second loss and only the second loss in the last two seasons for the defending champs. 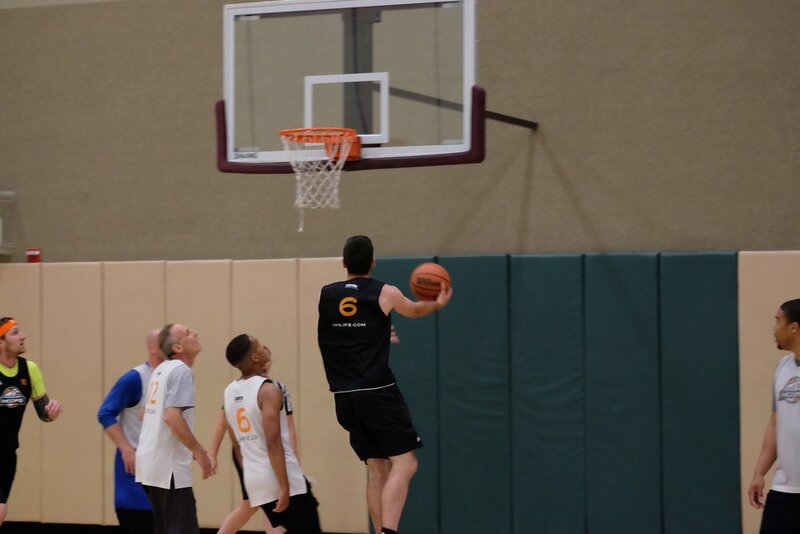 Level Up’s Isaiah Butler, who has been on a scoring rampage since joining the league, dropped 55 points shooting 66 percent from the field and 50 percent from deep. He also ripped down 17 rebounds in that victory. Butler is the Ultimate Hoops National Leader in scoring at 53.0 points per game. G88 has the most balanced offensive attack of all teams this season. In their sole matchup vs Level Up they had five of six players playing go for double figure but were led in scoring by off guard Josh Rader with his 26 points. What makes G88 so good as a team and hard to beat is their constant ball movement and selflessness. They have six of eight players on the roster averaging double figures. They don’t care who scores, they are just looking for the open guy. Not only does it show on the floor when they play but also on the stat sheet as they lead all teams in assists this season with 18 per game. It’s no secret that Level Up’s Butler is there go to player and scoring machine. The key for them will to be able to have a strong outing from their supporting cast. They also have a balanced attack with six of their seven players averaging double figures as well. This game will come down to defense stops. Which ever team can limit easy baskets and dominate the glass limiting second chance points should win this game. If it does in fact come down to Outlawz vs Gr8ful Eight this will be and epic battle of two teams hungry for the win and the respect. Both teams feature some on the more familiar faces in Saturday morning and Tuesday night runs. Both teams will be looking for battle until the end not only for the UH crown but supreme bragging rights throughout the club. Expect a high pace up and down game with strong defense efforts on both ends. This will be a chippy game as both teams are very familiar with each other. These teams met once during the regular season that the Outlawz won 103-85. One thing to keep in mind is that Gr8ful Eight, due to their individual schedules, were only available to play on Wednesday night, which resulted in them playing two games a week both on Wednesday. When they played the Outlawz it was their second game of the night. Not to give them any excuses, but it’s never easy to play a double-header, especially vs the top team in the league. With that said, don’t let the 18-point loss fool you. This will be a battle until the very end. To get to the championship both teams will have to play two games. Gr8ful Eight might even have a slight advantage because they have been conditioning for this all season. No excuses for anyone. The hungry, more efficient team will win. Final Prediction: Gr8ful Eight Pulls off the upset and repeats as champions wining by three.